How I came to be in possession of this pen is a very disturbing and upsetting story. You may wish to remain seated while I tell this terrible tale. It began on an ordinary visit to my parents house one Sunday afternoon. I'm sitting in the garden and my Mum says she has something for me. 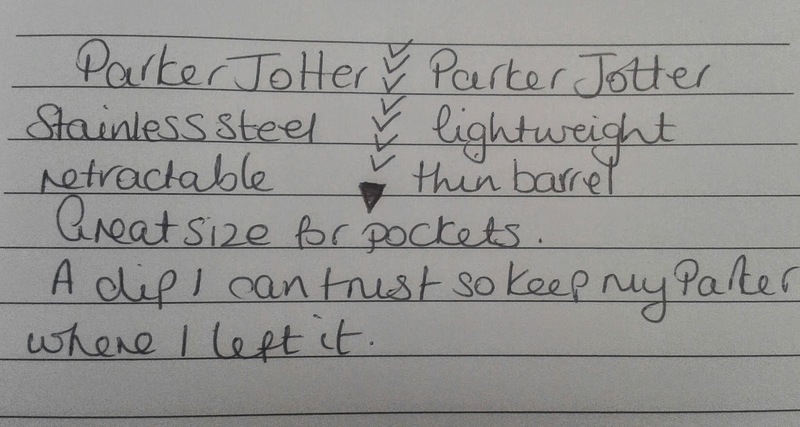 She disappears into the house and returns with this Parker Jotter. It was missing a refill but along with the pen she handed me an unopened Parker Fine point refill which I immediately opened so I could bring the pen to life and test it's capabilities. It was then that my Dad drops the bombshell. It was my brothers pen and he was going to throw it in the bin. Now why on earth would he do that? He has a sister who he knows has a mild,small, slight, OK who am I kidding, huge pen obsession, so why deny me the pleasure of another pen to put through its paces? What was it about this pen that offended him so much that he thought the only place for it was the bin? 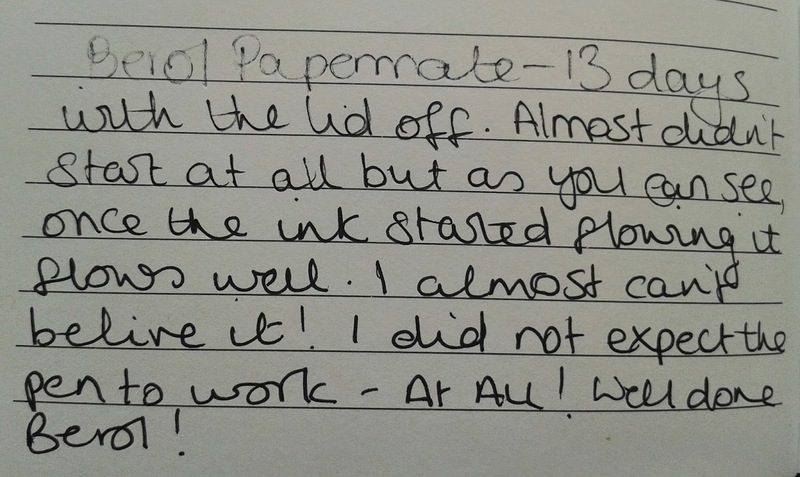 Thankfully my parents were there to save the life of this Parker Jotter so my mission is to review it and see if I can get to the bottom of why it was so cruelly cast aside. 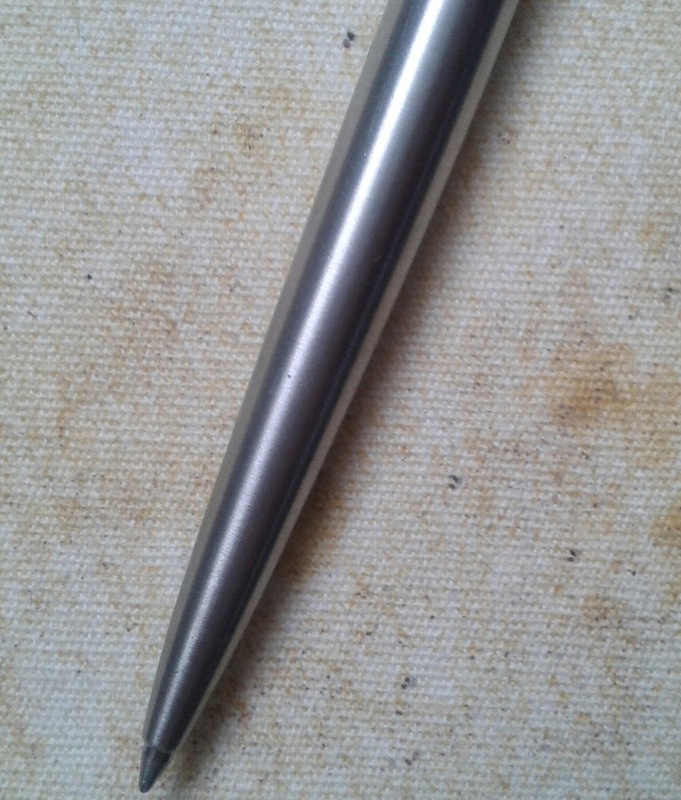 This Parker Jotter is made from stainless steel. It's one of the more neutral Jotter designs which means it's ideal for just about any setting and is unlikely to cause offence with it's colour (unless you're my brother). Maybe my brother just wanted a pen with more personality, in which case he could have gone for one of the coloured options or even the Premium Parker Jotter which looks just that little bit more special. The pen is a small size at 13cm long. It's slightly shorter than most of the pens in my pen pot but not as much as I first imagined it would be. I think it feels smaller than it actually is. It is lightweight so I feel I can move freely across the paper and if it wasn't for the barrel being so thin I would barely even notice I'm holding a pen at all. The body of the pen thins towards the tip and the lack of a grip can make it feel slippery after a while. My fingers overlap when I try to grip the pen on the thinner end which makes it quite uncomfortable and awkward and the whole thing becomes an ordeal. Holding the pen on the thicker section helps to keep slipping at a minimum and makes it much more comfortable to use. The pen responds well to paper. It's smooth but offers just enough resistance without feeling scratchy to give me a sense of control. I'm all for exceptionally smooth pens but there is such a thing as too smooth and Parker have ensured that this pen doesn't fall into that category. The ink flow is typical of that of a ballpoint, occasional false starts, the odd skip here and there but nothing so bad that I feel spoils my writing. They are flaws that if I'm honest I've come to expect in a ballpoint and with this Parker I must say the occasional blips are far and few between so it is one of the better ballpoints in my collection. The Arrow clip which makes a Parker instantly recognisable is definitely my friend. I can clip this pen to anything I want, be it a single sheet of paper, the thick cover of my notebook or onto my pocket and trust that the clip will keep my Parker safe. One drawback of the super secure clip is that it clings to a sheet of paper so tightly that it sometimes leaves a mark so if you need something to stay in pristine condition don't clip the Parker to it. Otherwise go ahead, your pen is safe. The Parker's small frame has it's benefits, this pen slots perfectly into any of my pockets without the slightest hint of discomfort. This is a Parker don't you know! 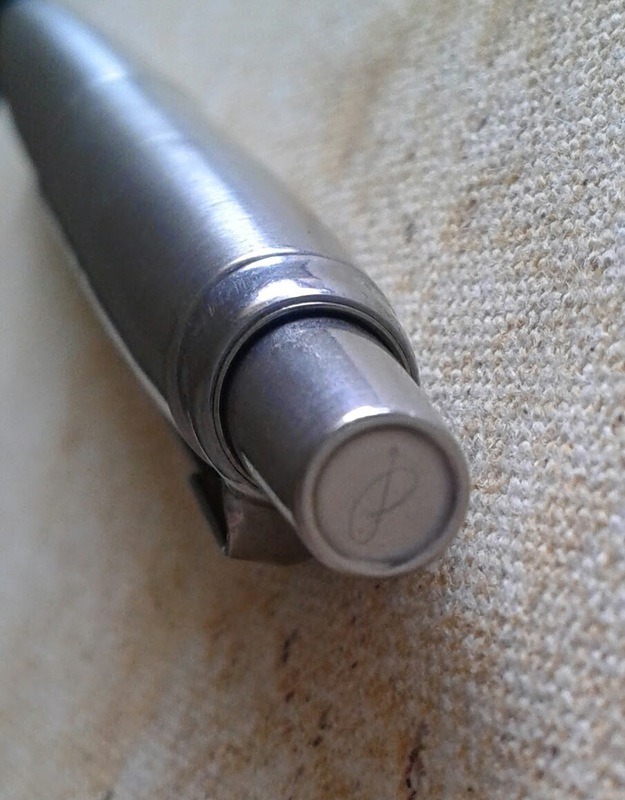 The Parker Jotter has a clicky button with P for Parker just in case anyone missed signature clip. One small annoyance, the pen rattles ever so slightly if you shake it. I know what you're thinking, then don't shake it, but I can't help it. It's the refill inside rattling about. I did have a look inside to see if maybe I'd missed something and the refill wasn't secured properly but as far as I can see it just drops into the slot in the barrel. There's no way to secure it. The Parker Jotter is refillable and there is a selection of different refills available so you can really make this pen your own. 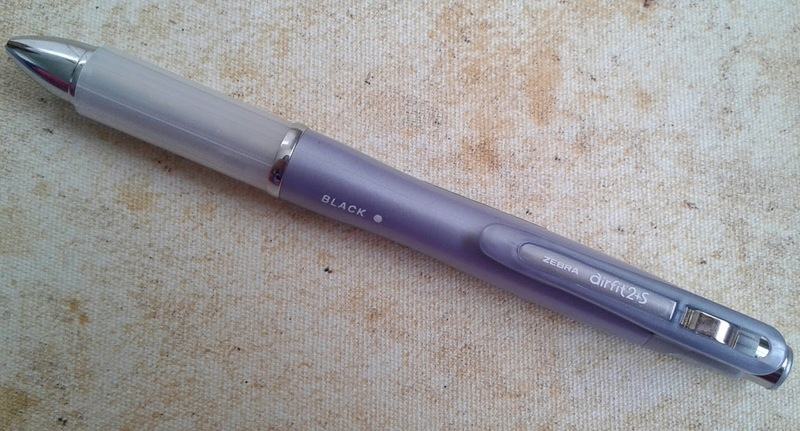 I've used a fine point ballpoint refill in black as it's what I was given with the pen but at some point I might try it with a Parker Gel ballpoint refill just for fun. Overall I'd say it's an alright pen. It's reasonably comfortable to hold once I got used to it's petite frame. It's portable, it feels smooth to write with, the ink flow is perfectly acceptable and it doesn't follow in the footsteps of some ballpoints which seem to go out of their way to infuriate me. It does what I ask of it most of the time. As the name suggests this pen is great for jotting. Jotting down notes, numbers, job lists for the other half, whatever you want to jot, the Parker Jotter is ready and waiting and it certainly doesn't belong in the bin. I'm a sucker for gadgets and cute and quirky little contraptions, and this Zebra Airfit 2+S is no exception. It's cute, it's cool, and it's multi functional. A pen that can multi task is always worth a look in my view. The S in the name had me stumped. I knew it was something to do with the pencil but I couldn't think what. I just couldn't let it go so I contacted Zebra to ask and they very kindly replied and let me know that it stands for sharp. I'm sure you will all sleep better tonight knowing that. I certainly did. 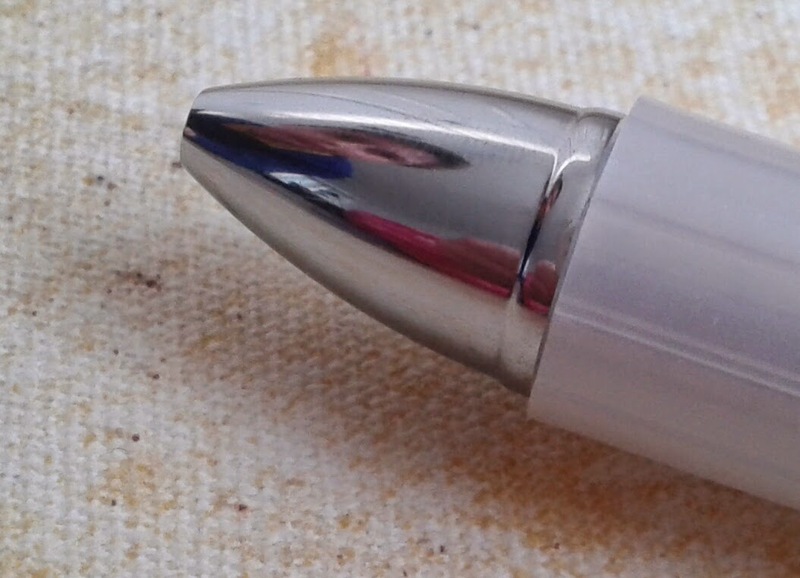 The barrel is mostly made of plastic, with a rubber air cushioned grip, a few small metal parts in clip and the bullet shaped metal part at the end of the pen which captured the image of my nosey son brilliantly. 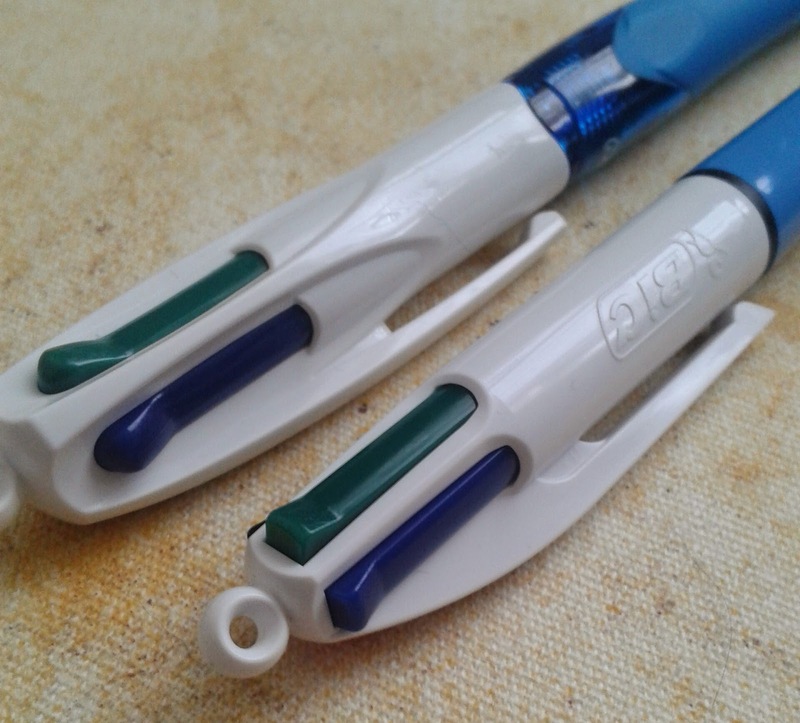 Unlike many multifunctional pens which have a slider for each colour, this pen uses a rotating clip. Just rotate the clip so that it points to the colour you need and away you go. 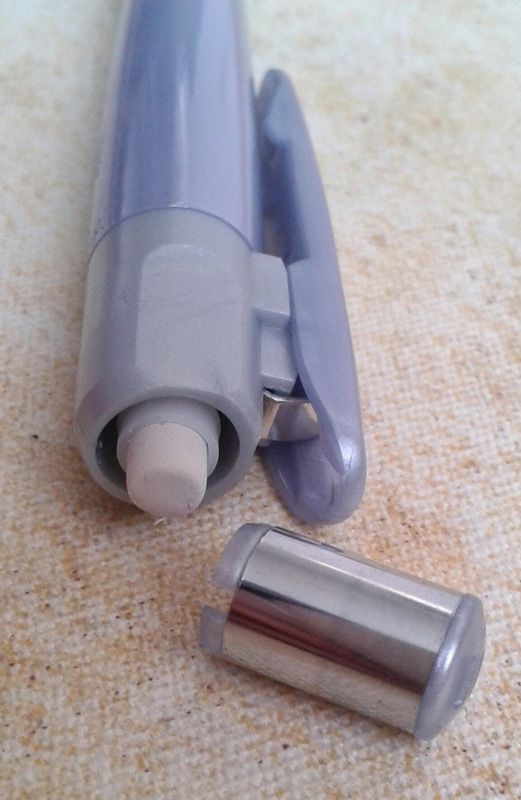 To make it pocket safe, have the clip pointed in between the markers and the pen tips will be tucked safely inside. I found myself spending far too much time turning the clip to watch the colours pop in and out, very much like people walking through a revolving door. The air cushion grip felt a little strange to begin with. It's squashiness beneath my fingers while I was writing wasn't what I was used to but it wasn't long before I began to actually like the cushioned feel. I realised that the little bit of extra comfort compensated for the fact that the barrel is wider and heavier than a typical ballpoint. It absorbed some of the extra pressure that I find myself applying to keep a comfortable and steady hold. Bulky pens are usually a great excuse for me to have a good whining session about how uncomfortable and clumsy they can feel but the cushion grip distracted me and my whine was forgotten before it even began. By now you may know that fine point pens are always my first choice where point size is concerned. 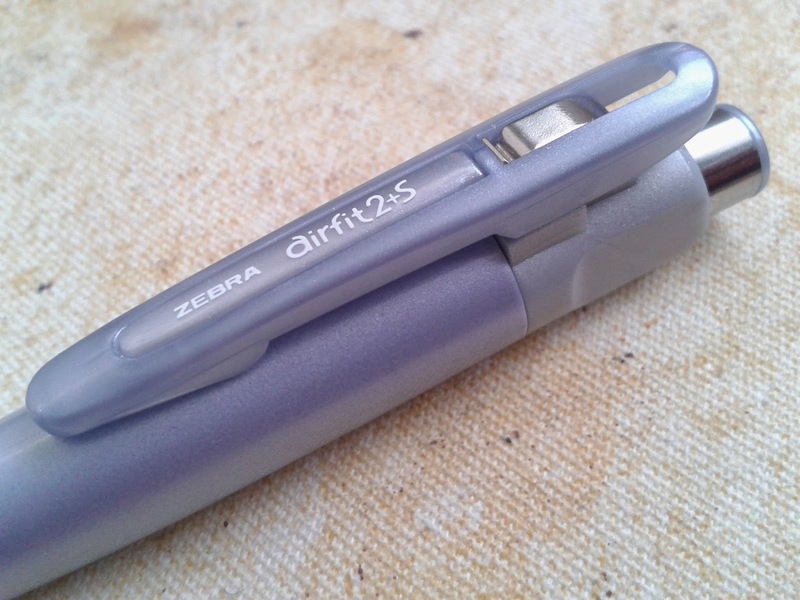 This Zebra Airfit 2+S contains a fine 0.7 black and red refill and a 0.5 pencil and although they are ballpoints which are not usually my first choice, this pen felt good both to hold and on contact with paper. The fine points make my handwriting appear clearer and much more readable. This pen glides across the paper with total ease. It hasn't left me one unsightly blob, it doesn't smudge and every single time I use this pen it writes first time, with no messing about. Ballpoints are known for their occasional false starts so I was over the moon when this pen proved that there are some good ballpoints out there. I must admit the ink flow isn't 100% consistent. When I looked really closely at my writing sample I noticed that the pen does seem a little skippy. I was so happy with how it felt to write with, it's smoothness, it's comfort, it's fine lines, that I was quite cross at having to come crashing back down to earth and admit that this pen isn't perfect. I consoled myself with the fact that the skipping isn't immediately noticeable, unless you're looking for it. The Airfit 2+S has a replaceable eraser hidden neatly away under a clicker button at the top of the pen. When the pencil is in use, pressing the clicker will expose more lead, just like a mechanical pencil. The clicker button is for pencil purposes only, it has no effect on the pens. The spring clip works like a clothes peg. Pressing it in opens it up which makes it super easy to use. The clip is great for thicker items, like a thick notebook cover or a stack of paper but when I clipped it to my pocket I was able to slide it off far too easily for me to be able to trust it completely. The pen is refillable. It has no problems carrying 4 lead refills and takes Zebra SK 07 ballpoint refills. So the pen may not be perfect but for a multi pen it's probably the best one I've used so far. It's a smooth writer, it's convenient, its stylish and it just feels good. 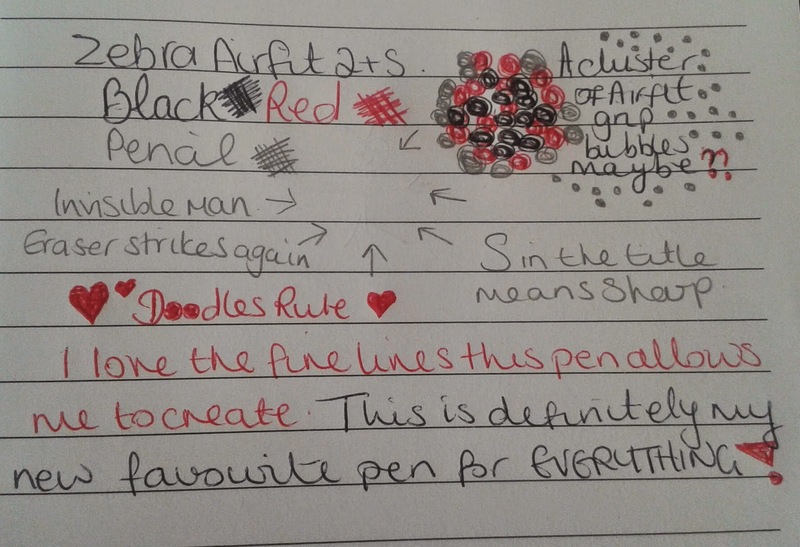 It's a pen that now lives in my handbag or my pocket when I'm at work so I can use it for all of my daily scribbles. I just hope the clip doesn't let me down as this is a pen I'd feel sad about losing. 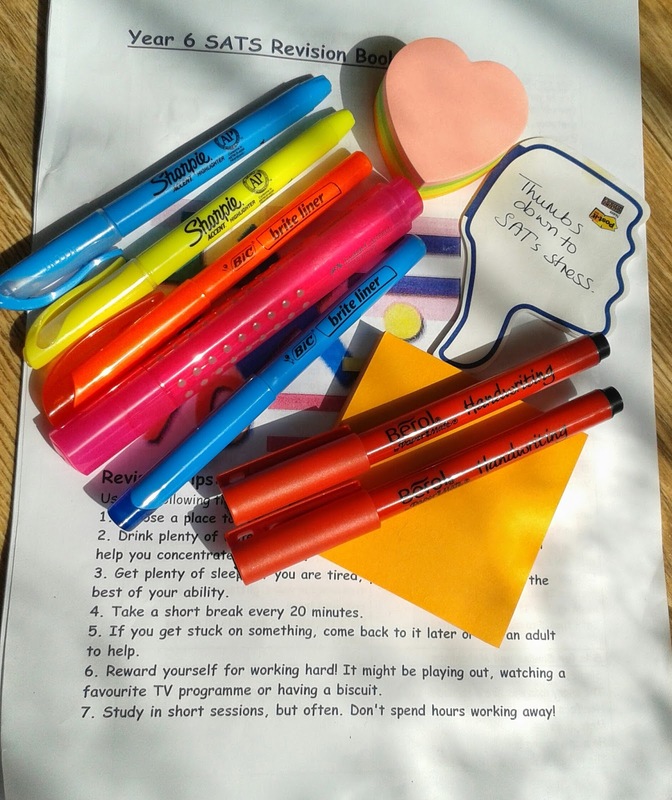 SAT's week is upon us and as my 11 year old son goes through the stressful time of tests and revision homework I thought it would be fitting to review the Berol by Paper Mate handwriting pen. It's the pen he was issued at school after earning his Pen Licence. I went out and bought a set for this review, and when I'm finished he can have them, so he can avoid having to explain to his teacher why he's lost yet another Berol. 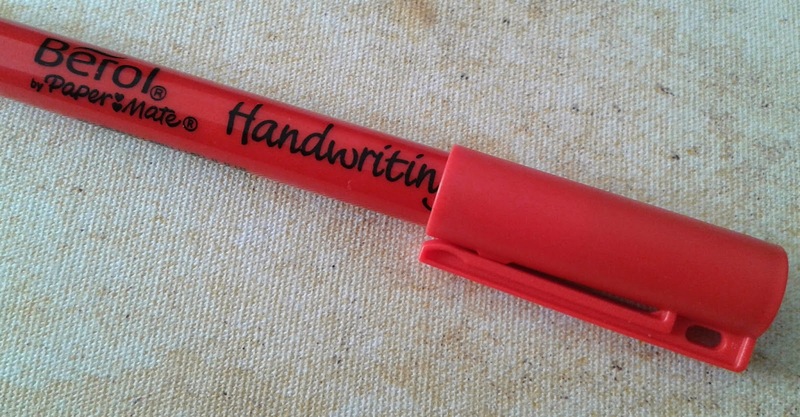 I was also a user of the Berol Handwriting pen in primary school some 20+ years ago so schools across the country obviously feel strongly about the quality of these pens otherwise surely they wouldn't continue to use them. I remember it was luck of the draw, who picked a working pen from the pot and who got lumbered with the ones that had completely dried out and having to make that trip to the bin to sharpen their pencil. 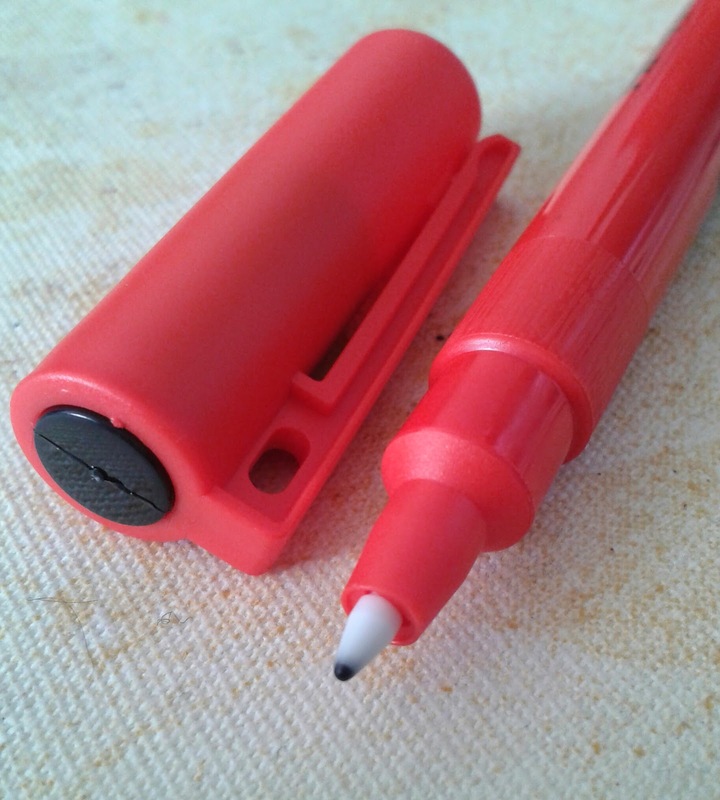 The Berol Handwriting pen is made of plastic, including the plastic tip. Although the pen is designed for children, the barrel isn't an attractive one. I'm undecided as to whether that's good or bad. 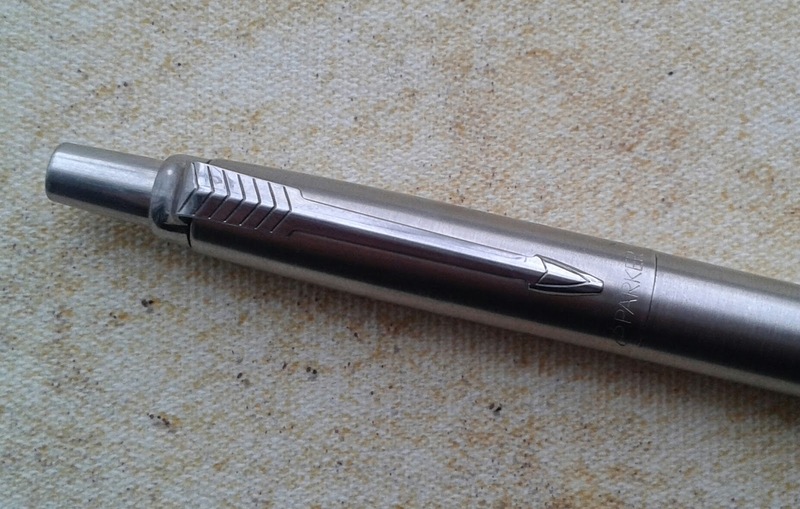 Would a more attractive pen catch their eye and make them want to use it outside school hours, for pleasure? Or would it distract the children from their school work and disrupt their flow of thought? I'm not sure. Maybe the children don't care either way. I asked my son what he thought and he shrugged and said it's just a pen. The pen does write very well. The ink flow is consistent, there is no skipping or blobbing to spoil the childrens hard work. The ink looks nice on paper, no feathering or bleeding through the page unless you leave the tip on one spot for more than a few seconds. The ink dries in less than a second, which is perfect for those left handers who are still learning the best way to write without smudging. There is a small amount of resistance on the paper (not the scratchy type) which is good as it encourages the children to take their time, helping them produce a beautiful piece of writing. The pen is lightweight and comfortable to hold when held right. At the tip there are a couple of steps and the best place to hold the pen is on the largest step. There is a tiny bit of added texture on the largest step although not enough to say it has any function as a grip. I would have liked to see a rubber grip on this pen. My son has said that he experienced slipping after a heavy writing session and the steps dug into his fingers so he had to keep readjusting his grip and position. A rubber grip would have prevented this. As it is lightweight and easy flowing, not much pressure is needed to write, preventing any aching in the hand after writing for long periods of time. The lid posts well and doesn't alter the balance of the pen too much so lids that have rolled off the table, never to be seen again needn't be an issue. The ink will wash out of most fabrics. This matters to me. A few weeks ago my son came home with a smiley face drawn on his school shirt which is still there today after much scrubbing and huffing and puffing. If he'd done it with a Berol it wouldn't have mattered. I'm sure to him it seemed like a good idea at the time! 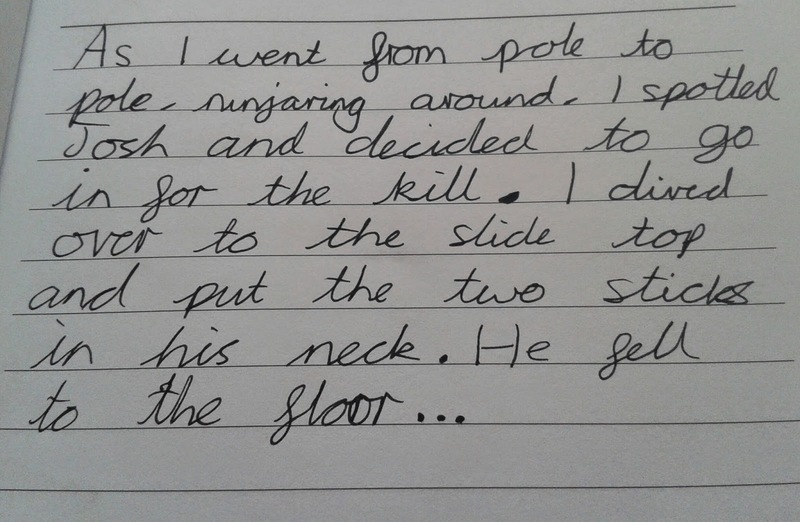 I can see why the Berol Handwriting pen has become the school pen of choice. It's comfortable, it's smooth and consistent without being too inky and allows the children to concentrate on the quality of their writing and not be distracted by issues with the pen. Its a medium point so a good line width, not to bold or too thin. And they are robust. The nibs are strong and the barrel isn't going to bat an eyelid at being dropped on the floor ten times a day. One final thing - The Berol Handwriting pen claims that it "will not dry out for at least 14 days if the cap is left off". I'm having difficulty believing it so I'm going to try it. I'm going to leave one of the pens with the lid off at room temperature for 13 days (so I'm definitely within the time frame) and see what happens. I won't touch it at all until the 13 days are up. I'll update you with the results. Do you think it will dry out or not? Good Luck to everyone taking exams this week. You can do it! As I stated above, I wanted to test Berols claim that the pen would still work if left uncapped for 14 days. I said I would leave it 13 days but it was a busy few days and I ended up not testing the pen until day 15. It works! It was touch and go to start with but as you can see, only 4 words into the sample the pen had woken up and was as good as it was on day one. I couldn't believe it. If I'm honest I didn't think the pen would work at all and I have to say, I'm seriously impressed. Well done Berol! I was recently reminded of my love for the Bic 4 Colours pen via a link to this advert which had me chuckling to myself for quite some time. I realised it was time to dig out my Bic 4 colours and show it some appreciation, and just to make things a little more interesting I went and bought the Grip version to see how they compare. 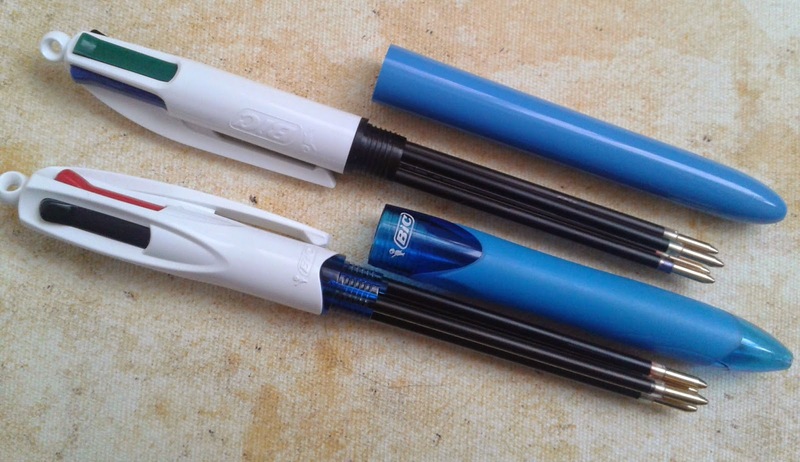 Both pens are made of plastic, with the Grip version having a rubber grip and being the more attractive of the two. 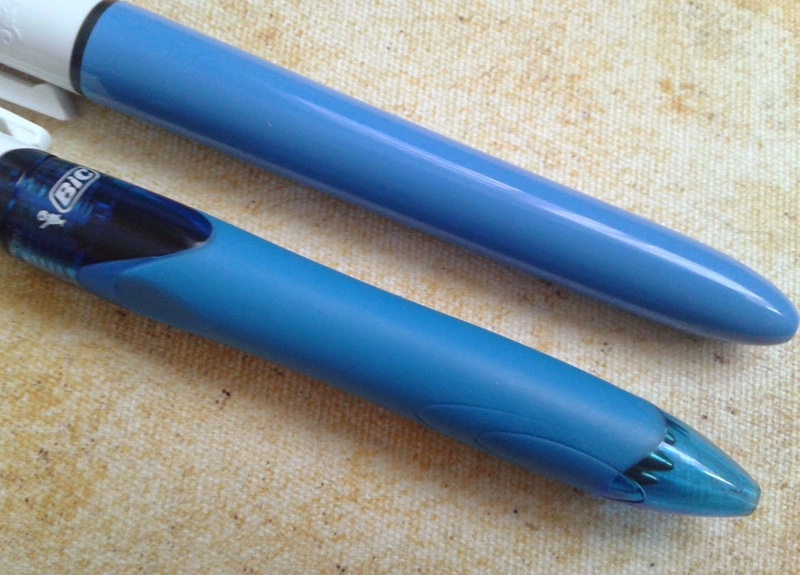 The Grip pen has a see-through blue window in the middle and one at the tip so you can see the refills going to work as you slide your colour of choice into action. The Grip version is slightly heavier and slightly thicker than the classic 4 Colour. I quickly realised that those slight differences made a massive difference to how they feel in the hand. The Grip pen felt absolutely huge whilst writing. It's just that little bit too bulky for my liking. The non grip version is still thicker than your average ballpoint, which of course it has to be, it's carrying 4 refills, but it didn't feel like it was taking over. The Grip version felt a little overpowering and my hand did start to ache after a while. I found the most comfortable way to hold the classic version without any slipping was to hold it just above where it starts to curve in towards the tip. 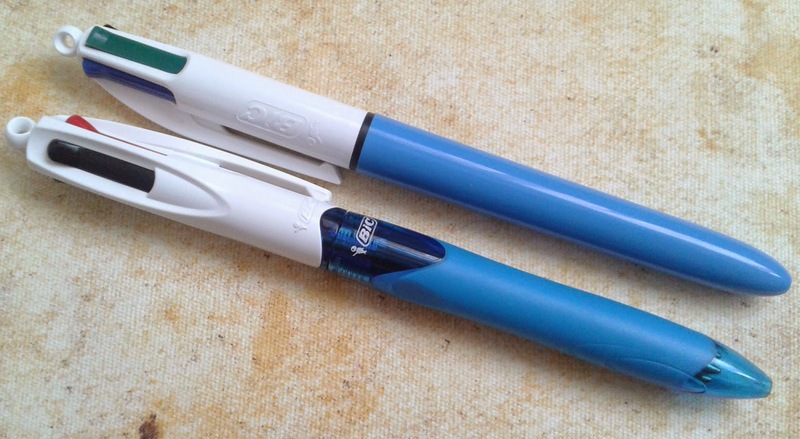 Despite not having a grip, it was more comfortable to hold for longer periods of time than the Grip pen. Some store own brand multi-colour pens have disappointed me in the past, with wobbly, unstable tips that are unpleasant to write with. The Bic 4 colours put those pens to shame. There is no unwanted movement from the tip whatsoever when I'm writing. I can't say I'm particularly keen on the clip design. When I clip the pens to my notebooks or my pocket they stick out too far as the functional part of the clip doesn't reach the top of the pen. At least I have the lanyard hook to fall back on, although I can't seem to fight the urge to chew on it. I'm not usually a pen chewer so I'm working hard to break my new habit before it becomes an issue. The Bic 4 Colours are refillable and what I love is that you can buy the colours you need individually. I have a thing for the green so there will be no need to despair when it reaches the end of its life. I won't have to buy a whole new pen or a set of four refills. The Bic 4 colours is also available with a 0.7mm point which comes in an orange barrel. 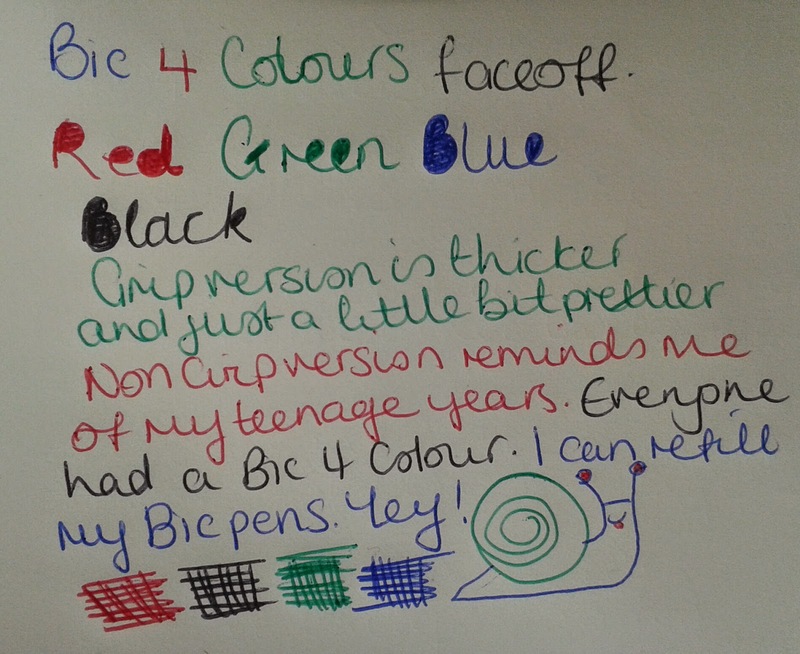 The Bic 4 Colours Fashion comes with pink, purple, turquoise and green ink. If you want a more glitzy pen you could go for the Bic 4 colours Shine. 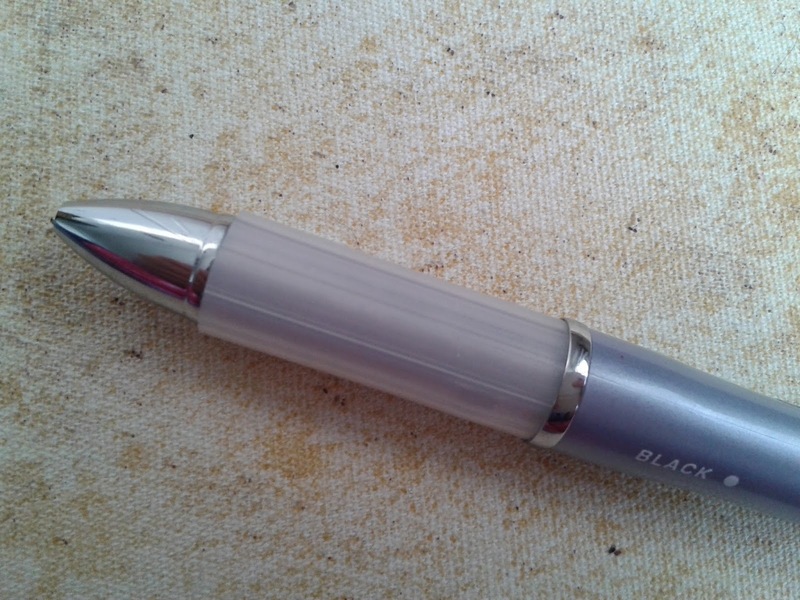 For those who don't want their pens screaming out with colour, you could go for a black or grey barrel. Or how about a Hello Kitty 4 Colours pen? You can even get a Bic 4 colours desk pen, the type of thing you find in a bank, with a chain, but all the colours are either blue or black. Bic have made a version of this pen for absolutely everyone. Both of my Bic pens performed fantastically on paper. However, the classic version, without the grip remains my favourite, purely because it is the most comfortable to hold. If the Grip version was the same width as the Classic it would change everything. The Bic 4 Colours pens take me back to my childhood. They were the perfect school accessory as all the colours we needed were right there at the slide of a button. It doesn't surprise me one bit that they remain just as relevant today as they were then. Here's one more Bic 4 Colours advert that I love. 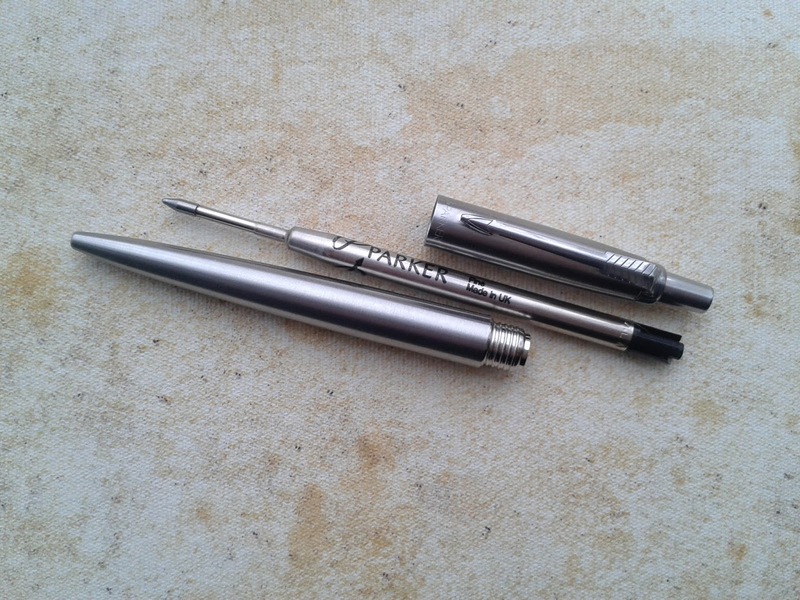 The Pilot V5 Hi-Tecpoint is a plastic pen with a metal clip. The appearance of the pen isn't exactly oozing with wow factor but maybe Pilot thought they would let the pen speak for itself and allow the beauty from within to shine through? Lets see.. The V5 weighs very little which helps me out quite a bit with the grip area being so smooth. It means I can hold it comfortably without slipping. I don't need to grip too hard to keep it balanced and I feel like I'm in complete control. The clear plastic on the grip area means I can easily keep track of my ink usage. I was expecting the needle point tip to feel quite delicate and to maybe feel a bit of flex whilst writing but I was completely wrong. It is firmly in place and feels surprisingly robust. I'm quite confident this needlepoint will stand the test of time. The V5 is an extra fine 0.5mm tip and I really love how the thinner lines look. A thinner tip makes my writing look so much neater. The lines are clean and sharp. The ink flow is impressive. 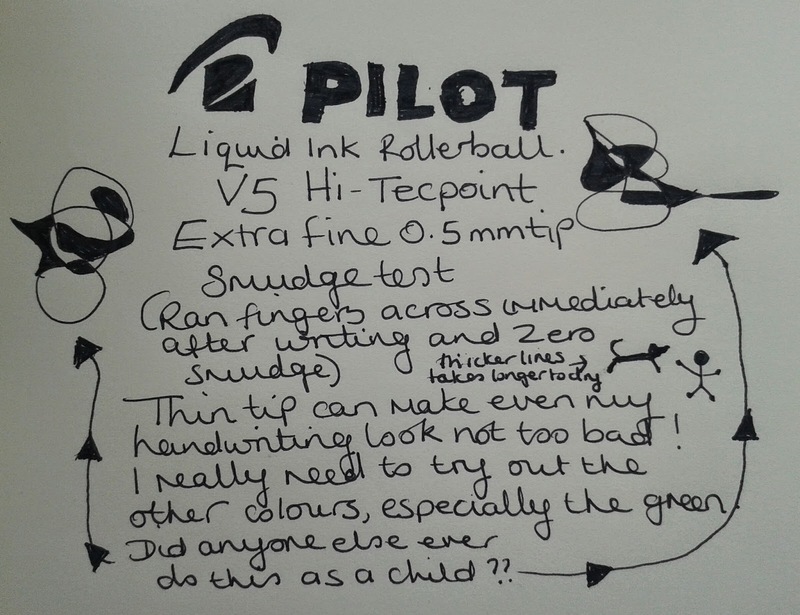 There are no false starts, no skipping, although on more absorbent paper I did experience some fuzziness but it's a common issue with rollerballs. When writing normally the ink drys almost immediately. With heavier use such as in the image above it can take a few seconds before it is completely dry. The heavier marks on the sample above did bleed through the page and left a few marks on the opposite page too. My first impression when thinking about the smoothness of the pen on paper was that it was a little scratchy. It wasn't as effortless as I would have liked. I think with it being an extra fine needlepoint it's bound to feel a little sharp. Having said this, after a few days of getting to know the V5 I found myself subconsciously adapting my grip and the pressure I was applying and found my writing experience improved massively. Paper plays a part too, the smoother the paper the smoother the pen feels to write with. It was just a case of getting used to a different type of tip and now I can honestly say a fine needlepoint is my favourite so far. The metal clip has Pilot etched into it but it's barely noticeable unless you hold it up to the light, and even then I had to get the angle right to see it clearly. The lid itself is extremely secure and posts well. The lid may even be a little too secure. You'll know it's on properly because it will click. To take it off requires some force. Just hold it away from your face when you pull to avoid giving yourself a thick lip when the lid is eventually pulled free. Maybe I'm just weak. I don't know. The best way to get the lid off easily is to pull it quickly, a bit like ripping off a plaster. A secure lid, even if it is annoyingly too secure (could just be me) is a good thing. If I lose this pen it definitely won't be because the lid was loose. The clip is quite flexible and clips firmly onto even just one sheet of paper. 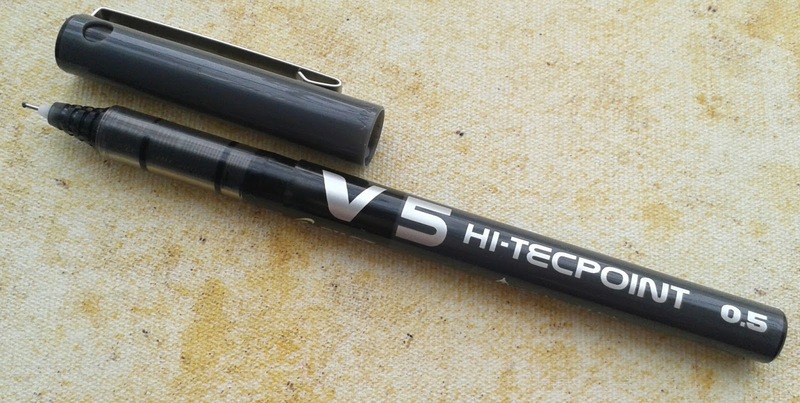 Unfortunately this version of the Pilot V5 Hi-Tecpoint is not refillable. 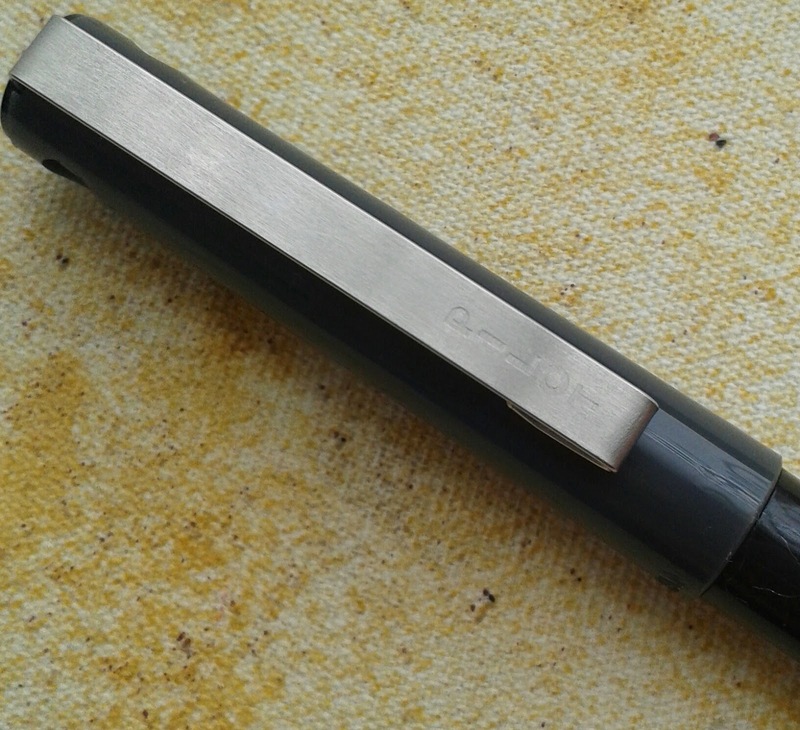 However a refillable version is available - the Pilot V5 Cartridge system which uses a cartridge like a fountain pen. Had I known this at the time of purchase I would have definitely waited and sought out the refillable option. The V5 is also available in red, blue, green, violet, pink and turquoise which I'd love to try at some point, especially the green. So maybe it wasn't love at first sight but it's no nonsense appearance has grown on me. This is a pen I can rely on to make my writing look as presentable as it will ever be. It's a pen I can rely on to not lose its head lid when times get rough and it's a pen that will provide me with a consistent flow of ink until the bitter end.